South Bend, Indiana October 9, 2018 -Wiegmann has introduced the T-CHSS line of stainless steel wire troughs. 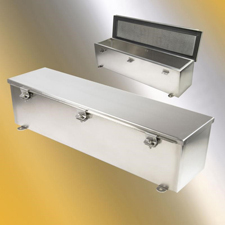 These new hinged cover enclosures provide superior protection for electrical wiring in corrosive environments. Wiegmann, part of Hubbell Commercial Construction, provides innovative electrical products to OEM, industrial and commercial markets. Wiegmann's new products are based on the company's existing T-CH product line. Adding stainless steel to this design provides corrosion resistance. The NEMA 4X rated T-CHSS models provide greater protection than painted steel products for electrical components. Availability of Wiegmann T-CHSS stainless steel enclosures begins late 3Q2018. Find more information at www.hubbell.com.